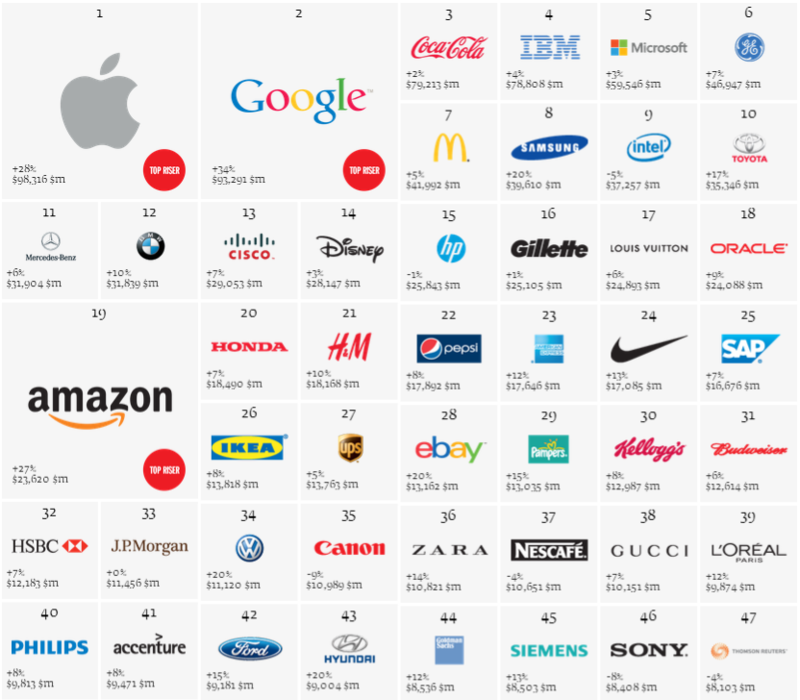 Apple has taken the the top spot from perennial champ Coca-Cola in the Interbrand global survey. Apple is worth a staggering $98.3bn to the Californian company, according to Interbrand's analysis, up a whopping 28 per cent on last year. But Google is snapping at its heels in the number two spot, up 34 per cent to $93bn. Other tech giants in the top 10 include IBM at 4, Microsoft at 5, Samsung at 8 and Intel at 9. HP, somehow, is at 15, losing just 1 per cent of its brand value, while Amazon is at 19, up a stonking 27 per cent to $23bn. What's at number 6 ? How come Philips is more valuable than Sony? Sony really hasn't been doing well - there was a point of time where cyber-shots, handycams, viaos, and walkmans were the best in their class. Not anymore. As for Phillips, my guess is that Phillip's grasp on some asian markets (e.g. India) earned them that position. Even though I don't use Apple products, Apple is probably the most well-managed brand in the world. They have earned it.